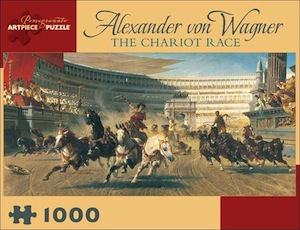 The Chariot Race (detail), c. 1872, by Alexander von Wagner. Published with the Manchester Art Gallery. Thoughtfully conceived and engagingly intricate, Pomegranate's 1,000-piece interlocking jigsaw puzzles combine superb color reproduction, stunning and unusual images, and sturdy construction to delight generations of novice and veteran puzzle workers. Puzzle size: 32 x 16".